The National Prayer Vigil for Life is an all-night pro-life prayer vigil held on the eve of the March for Life each January. Over 20,000 pilgrims from across the nation pray through the night for an end to abortion and a greater respect for all human life. 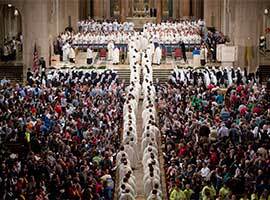 It is held at the Basilica of the National Shrine of the Immaculate Conception in Washington, D.C. The National Prayer Vigil for Life will be held from Thursday afternoon, January 17, through Friday morning, January 18, 2019. The Opening Mass begins Thursday, January 17 at 5:30 p.m. The National Rosary for Life begins at 8:00 p.m.
Night Prayer (Byzantine Rite) begins at 9:30 p.m.
Holy Hours begin at 11:00 p.m. and end at 6:00 a.m. on Friday, January 18. The Closing Mass begins Friday at 7:30 a.m.
For more information about this USCCB Pro-Life novena, go to: www.9daysforlife.com. For more information about this day of prayer, go to: www.usccb.org/prayer-and-worship/resources/january-22-day-of-prayer.cfm.